#281: Keith Green Launching | mark Joseph "young"
This is mark Joseph “young” blog entry #281, on the subject of Keith Green Launching. We come to someone whose perhaps brief footprint in the Christian contemporary music world was huge, so big in fact that we’re going to cover him in two articles. 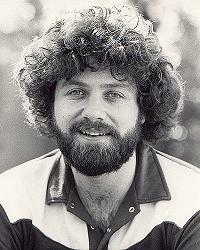 Keith Green might have been a footnote in the history of contemporary music, a one-hit wonder in the 60s who recorded a few singles for Decca and one for ERA, one of which charted at some point. Then, as he was facing the frustration of already being a has-been in a field in which maybe he never was, the Christian musicians of the area met him and brought the young Jewish boy to faith in Christ. He embraced his new faith strongly, and became something of a prophetic voice in contemporary Christian music, challenging believers to live the lives they claimed in words. In 1977 he released his first album, several of the songs co-written with his wife Melody, For Him Who Has Ears to Hear, packed with powerful, challenging, and excellent songs, beginning with You Put This Love In My Heart, continuing with I Can’t Believe It, Because of You, and When I Hear the Praises Start, and as the first side ends with the playful He’ll Take Care of the Rest, things get even better. Side two opened with Your Love Broke Through, the song he co-wrote with Phil Keaggy and Randy Stonehill, and then the genuinely fun song No One Believes In Me Anymore (Satan’s Lament), which is not a lament at all but the devil’s boast that he can work without being recognized. This is followed by the heart-breaking Song to My Parents (I Only Want to See You There), then Trials Turned to Gold, and the album concludes with his rousing rendition of Annie Herring’s famed Easter Song (the only version of which I am aware that has the second verse lyrics he sings). This was only the beginning, but every song on that first album was a classic–and he would follow it in the next year with No Compromise. This opened with the soft rock Soften Your Heart, then the heart-rending Make My Life a Prayer to You, written by his wife Melody. This is followed by the album’s fun song, Dear John Letter (To the Devil), then back to the heart-rending How Can They Live Without Jesus?. The flip side opens with the tearful and demanding Asleep in the Light, which on the original segued electronically into My Eyes are Dry, which faded in over the fadeout of the other, and then faded out. I am persuaded that it was a mistake in later releases to separate these two songs, as Keith clearly intended them to be heard together that way. After this heavy opening, it lightens with the rocky You!, and then another heart-felt song, I Don’t Wanna Fall Away From You (interestingly covered by Petra on their Keith Green tribute album). The bouncy Stained Glass gives a bit of relief before the intensely challenging To Obey Is Better Than Sacrifice. He then does a cover of the Jamie Owens (Collins) The Victor, which was her break into the Christian music field as the song gained popularity and was also picked up by The Second Chapter of Acts, who along with Phil Keaggy were part of Keith’s recording, and wraps the album with Altar Call, a closing call to salvation. There wasn’t a weak song on two albums, and Keith was one of the stars of Christian music, but things were about to change significantly. #258: British Invaders Malcolm and Alwyn. #260: Lamb and Jews for Jesus. #262: First Lady Honeytree of Jesus Music. #264: How About Danny Taylor. #268: Voice of the Second Chapter of Acts. #272: To the Bride Live.